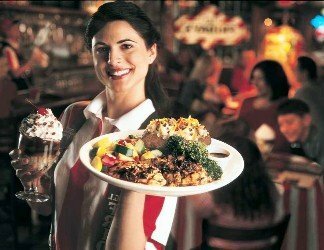 Home F & B Service Side Work: A Waiters or Waitresses Worst Enemy? Picture this: You’re at the end of a long shift of waiting tables. Your last table had not one, but two crying kids, and their parents ignored them while they crushed cereal into the carpet without cleaning it up. Two tables before that, an angry customer took you to task because the kitchen overcooked their burger, even though you rang the order in correctly. You’re late to meet up with friends, and your manager finally tells you you’re cut. You bus your last table, sweep up the last remaining corn flake on the floor, and you’re about to untie your apron and run joyfully into freedom……when you realize you haven’t done your side work yet. For those that don’t know, side work is sort of exactly what it sounds like. It’s work that you have to do on the side of your main task, which is serving food and waiting tables. Side work varies from restaurant to restaurant, but it’s generally a list of maintenance tasks that are required to keep a restaurant running smoothly, cleanly, and efficiently. Wiping down counters, refilling certain beverages, rolling napkins or silverware, cleaning the espresso machine, sweeping, filling salt and pepper shakers, and running laundry, are just a few of the examples of tasks that make up restaurant side work. Generally this decently long list of tasks is divided up by all of the waiters and waitresses that worked that shift, and depending on when you’re cut from the floor, you’ll have a certain chunk of the list that you’re responsible for. For instance, if you were the first server in and opened the restaurant and you get cut first, it makes no sense for you to clean the espresso machine and the coffee makers at 10 a.m., because someone is most certainly going to be ordering coffee and it defeats the purpose of your time spent. 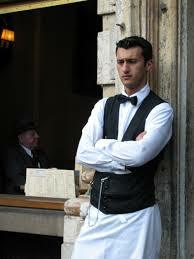 The problem with side work, as most waiters know, is that it just isn’t a priority during a normal work shift. Most of the time, it can’t be. When you’re running food, running beverages, greeting tables, and remembering what feels like a million things at once, you’re just not thinking about cleaning the floors of the restaurant. And that’s okay; it’s normal. But as side work is an inevitable part of being a waiter, here are a few tips on how to deal with side work more efficiently to make for a better serving shift, and get you in and out of your restaurant in good time having done your job to the best of your abilities. It’s easy to, I know, but if you keep it in the forefront of your mind, you’re going to be much better prepared to execute it during your shift. And even if you don’t have time to complete your side work during your shift, at least by remembering it’s coming, you set yourself up to not be bummed out when you realized there’s more to do before you can end your work shift. By keeping it in mind, you’ll be thinking about what needs to be done throughout your shift, and if you have a free five minutes, you might be able to get some things done. About to be cut in 45 minutes? Maybe you can sweep your section quickly, and wipe down some counters. When you check those off your list, there’s less to do at the very end of your shift, and you cut down on the time you have to stick around. Being proactive and avoiding procrastination can help you get out of the restaurant sooner and get on with your life faster. Keeping all these things in mind can help side work be a little more bearable and help get it done faster, getting you done with your shift and on with your life. But remember, it’s part of the gig. You can’t sign up to be a firefighter and say, “Yeah, I’m going to fight fires, but I’m just not going to climb ladders because I don’t like heights.” It’s part of the whole package and you should know that going into waiting tables. Too many times, I’ve worked with people who conveniently “forget” to do their side work, or do it as sloppily and quickly as possible just so they can clock out and leave. The biggest problem with side work, is that if you decide you’re not going to do it, or you’re going to do it poorly, then you end up punishing your fellow waiters and waitresses because they won’t have certain items stocked or certain places cleaned. And frankly, it’s a pretty easy reason to fire someone, if they’re simply not willing to do all of the essential elements of the job. Sometimes, as a waiter, you have to take a deep breath, puff out your chest and plow through it. And then you get to that well-earned beer on the other side of your shift!